To search and discover links between the first set of Norman families who ruled the fief of Ducey lands between 1100 A.D. to 1220 A.D. at the town of Ducey, France, and the subsequent migration of Ducyes, Ducies and Duceys to England, Ireland and elsewhere. It is not a family history designed to directly connect these early families with the many thousands of Duceys around the world today . This website builds on the book The Ducey Story and some Allied Families written and published by Sister Agnes Cecelia Ducey, in 1966, a member of the Religious Order of the Sacred Heart, then living in Omaha, Nebraska. Researched and written well before the internet age, she used personal contacts and the mails to access historical sources in France, England, Ireland and North America. Her facts and conclusions, have been re- checked and verified where possible with other sources now more freely available. Overall, the facts she uncovered were largely correct. In a very few cases, some important conclusions have been found to be more in the realm of supposition, perhaps because further information was unobtainable at the time she was writing. However, despite the amount of new information that has become accessible since introduction of the Internet, some key facts still remain to be further developed. d) who were the first Duceys to move to Ireland, and did they come from England or direct from Normandy? So, consider the following as a gathering together of information about the Ducey family, as summarized in December 2012. Much work remains to be done and we hope you can help. 1 – No Duceys left in Ducey. 2 – Town of Ducey, France. 3 – Gathering Ducey history. 5 – Duceys in France. 5.1 Duceys in France Family Timeline. 6 – Duceys/Ducyes/Ducies in England. 6.1 Ducie Lineage in England. 6.2 Internet Search of Ducies/Ducyes/Duceys in England. 7 – How did the Duceys get to Ireland? 7.1 Searching for early Duceys in Ireland. 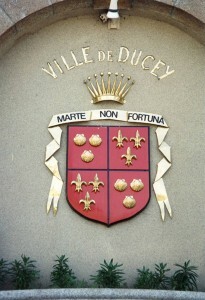 8 – “Ducey, the research of its past.” Early sections translated from the book Ducey, a la recherche de son passé, by Valérie Houlbert, Office de Tourisme de Ducey, 2007. 9 – Duceys, Ducyes in Willenhall and Walsall. 10 – Ducyes and Ducies of London.